Oops - we don't appear to have a video for the ScanSnap fi-5110EOX2. Brilliant! It came to me highly recommended to me by one of my clients and has certainly more than lived up to my expectations in all respects. Extremely simple and quick to use - scans documents literally in a \'snap\'. Tiny footprint, too, so economical on valuable office space. We purchased both a Fujitsu Fi-5110EOX2, and Fujitsu Fi-5120C last year. Both of these have performed fault-leesly through out the period we have owned them despite having a large amount of use. They are both quick and efficient, and their small footprint allows them to be used on the smallest of desks. The only slight problem I have had is with the Fi-5110EOX2 where I cannot seem to get the buttons on the scanner to scan directly into Adobe Acrobat, but this may just be a glitch on my system, also if you need any sort of flat bed capability these are not for you, but we do not so this is not an issue. The software provided is very good for the price, especially considering you are getting a full version of Acrobat. Overall I would recommend both scanners, both on price, performance and build quality. 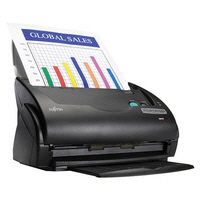 The Fujitsu ScanSnap Fi-5110EOX2 document management scanner software can automatically create Adobe PDF files which has become the de-facto standard for document exchange, enabling you to send documents anywhere in the world safe in the knowledge the receipient will see exactly what you see. Fujitsu ScanSnap can now scan information directly into either Word or Excel via OCR using the new Scan2Word and Scan2Excel functions intergrated into the ScanSnap software. When creating and storing PDF's created with the Fujitsu ScanSnap, PDF display capability will be second nature to your Windows system, since PDF can now be displayed as thumbnails thoughout the Windows file system. Making scanning as simple as possible, the Fujitsu ScanSnap can automatically decide if a document should be scanned in black and white or colour, what the size of the page being scanned is and eliminate blank pages, all of which serve to speed the scanning operation and minimise your storage requirements. The Fujitsu ScanSnap also includes CardMinder, an application which can intelligently capture the information from business cards. The underling database can be stored and exported to PIM software such as OutLook, ACT and Goldmine. Note: The Fujitsu ScanSnap device driver does not support the TWAIN or ISIS protocol. Scanned images cannot be acquired directly from a TWAIN or ISIS application.